“Food” & Garden is HERE! It’s the All in WDW Pre-Festival Top 10! This Year’s Menu! | It's "All in WDW"
“Food” & Garden is HERE! It’s the All in WDW Pre-Festival Top 10! This Year’s Menu! Good morning, my friends! The day has finally arrived. “Food” & Garden ’17 opens its doors this morning! So, when it comes to this year’s festival, two opposing forces descend upon me. Diet and Disney. To be truthful, it has me quite sad. I know. You’re going to WDW, Bob. Poor you. You see, over the last two months, I’ve successfully transformed my diet and exercise regime into something much more healthy. 15 pounds down, folks, and I don’t want to stop! Of course, the old adage is … calories don’t count in Disney, right? Well, as we all know, they certainly do. Sorry for that heart-crushing news, folks. Therefore, in the spirit of saving our “cheat days” for ADRs at Paddlefish and Planet Hollywood Observatory, Mrs. All in WDW and I have come up with a plan to take on Epcot’s “Spring Fling”. First, we cut our list down to a Top 10. Originally, it was going to be a 15-item menu. Second, we will share everything! Third, we’ll use “Food” & Garden to sub for the day’s breakfast and lunch. Finally, and fourth, when it comes to the scale, we’ll hope for the best! Having said all that, what is this year’s menu? What is our target list? Well, let’s see! I’ve chosen this one for my good friend and podcast partner – Dennis Conroy. I know he’s very sad he’s going to miss out on this dish. Right, Dennis? I’m in a very benevolent mood this festival. This item is on the menu for Mrs. All in WDW’s benefit. After all, her love of Food & Wine’s Lamb Chop is legendary. 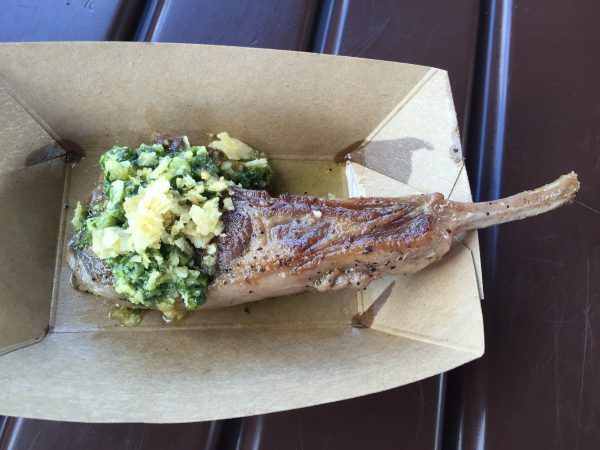 Food & Wine ’16 – Australia’s Lamb Chop! 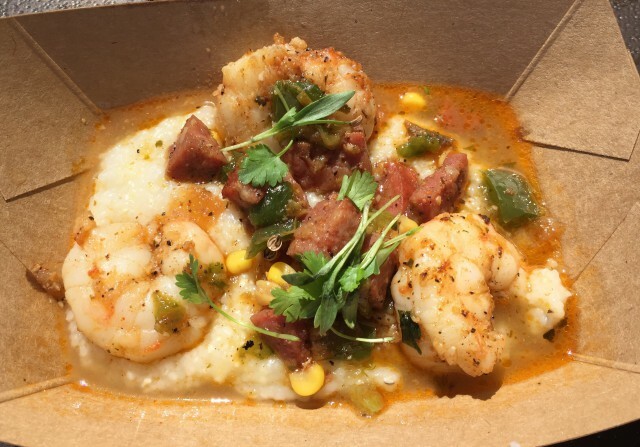 Epcot’s shrimp dishes always end up being very popular. How can I not try one that involves sugar cane? My diet is going to take a hit with this one, I’m afraid. I know. Baked chicken doesn’t seem all that exciting, does it? I’m clearly counting on the crawfish to separate it from the “pack” and make it much more interesting! We don’t get the chance to make “stuffed peppers” all that often, but I am quite fond of them. But, a “battered” version? Mmmm. Don’t let me down, Jardin! I know. Sounds pretty mundane, eh? It’s a meatball. What so exciting about a meatball? Well, have I ever told you about my adoration of Food & Wine’s Lamb Meatball? 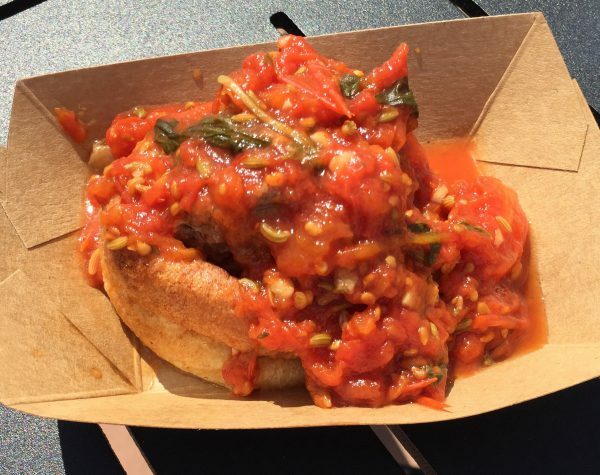 Food & Wine ’16 – New Zealand’s Lamb Meatball! 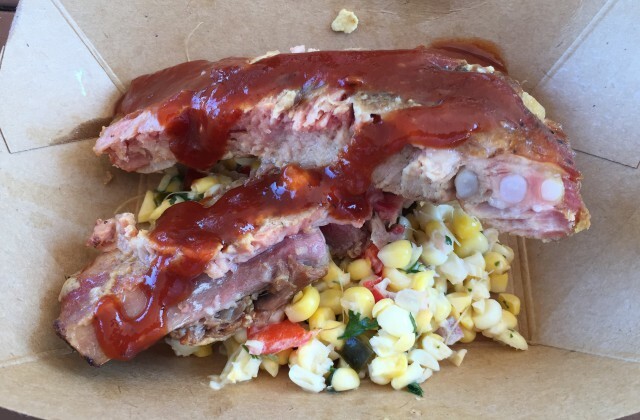 2016’s ribs were fall off the bone tender and one of Mrs. All in WDW’s festival-favorites. I have to admit, they were quite good! I loved the corn salad, as well. “Food” & Garden ’16 – The Smokehouse’s Ribs! I love that Disney presented this menu item as scallops. Plural. It would be great to not have to share a single scallop with Mrs. All in WDW this year. The American Adventure’s smokehouse usually delivers great food, and this dish is their crowning achievement. What a meal! This one can fill you up for the entire day! 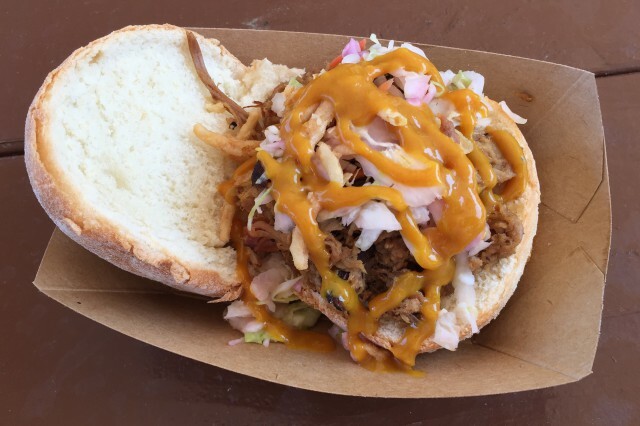 “Food” & Garden ’16 – The Smokehouse’s Pig Slider! This is how I’ve described this dish in the past … it’s a symphony of flavors, folks. An absolute orchestra! One of Epcot’s best-ever festival dishes, in my opinion. Best. EVER! “Food” & Garden ’16 – Florida Fresh’s Shrimp and Stone-ground Grits! There you go, my friends! That’s our full “hit list” for 2017. Will some other items sneak onto our palates? The diet will probably win, but only time will tell! ← The 2017 WDW Fans’ Top 15 Hollywood Studios Attractions!